For a sleep aid that won't leave your groggy, try Midnite®. Falling asleep and staying asleep can be difficult as daily pressures of life keep minds active. Where most sleep aids leave you groggy in the morning, drug-free MidNite® is different..
MidNite® contains a specially formulated combination of melatonin – the hormone naturally produced by your body to control your sleep / wake cycle – and herbs of lavender, lemon balm and chamomile that work with the body’s sleep mechanism to promote natural sleep. MidNite® works even when you wake up in the middle of the night and can’t get back to sleep. If you have at least a 3-hour window, you have enough time to take MidNite® to feel more rested in the morning. 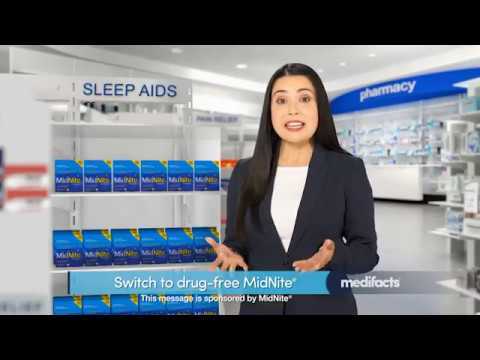 Plus, because each tablet is chewable and comes in an easy-to-open blister pack, MidNite® is the solution for occasional sleeplessness you can take without water or leaving the comfort of your bed. Wake feeling refreshed – switch to Drug-Free MidNite® tonight. © Buchanan Group Member Code of Conduct | Terms & Conditions | Privacy | Contact | What is Medifacts?